Cospicua has produced many a good football player. Throughout the long history of association football in Malta, many were the star players from Cottonera who wrote their name in gold in the annals of our national game. Who can forget such names as Karmenu 'Balolu' Tabone and 'Garaga' Busuttil, Josie and Johnnie Fearne, Masu Hicks and, more recently, Peppi Delceppo and Freddie Delia. 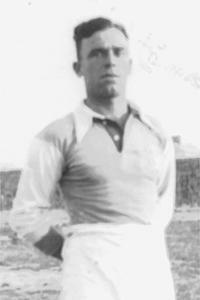 One of the most popular players of the 30s and early 40s was Wenzu Mizzi, known in football circles as 'Il-Bagaga'. Mizzi also came from Cospicua where he learnt his trade playing football within the bastions of the historical old city. Yet, surprisingly, his first club were not St George's. He started his career in season 1928-29 with Valletta Utd, probably because St George's were serving a suspension by the MFA. Born on October 28, 1906, Mizzi was baptised in the church of the Immaculate Conception. His father, Lorenzo, died a few days after the birth of his son and his wife Felicia, nèe Pisci, decided to name her baby Lawrence after his father. Wenzu grew with a great passion for football. He was soon noticed by the administrators of the St George's club. The late 20s however, were not the best of years for the Cospicua club. This era was marked by serious trouble and rows with the Malta FA which led to the partial disbandment of the club. This forced Wenzu to seek his fortune outside his town and by 1928 he was playing across the harbour for Valletta United. A fine centre-half, he could play equally well at left-half or full-back. He was popular and his reputation was so good that he went on to play for several clubs. His best years were with Hibs and St George's. Between 1932 and 1935 he formed part of the great Hibs side which saved Maltese football from extinction after the struggles of the 20s. His performances for the Paolites against HMS Royal Sovereign are still talked about with nostalgia in Paola. From Hibs, Mizzi moved to Qormi St George's, before settling down with his hometown team St George's. In season 1939-40, he helped the Saints beat Sliema Wanderers in the final of the Christmas Cup. The war interrupted his career but at the end of hostilities, although by now well in his 30s, Mizzi rejoined St George's. He kept playing well into the 1946-47 season when he finally quit the game for good. Mizzi's career was long and varied and his total of 52 league matches was one of the biggest for a player of his era. During the war, Mizzi's family went through some harrowing experiences. In the first air-raid on Malta, their house in Cospicua was destroyed and the family had to find another in Zabbar. It was not long however, before their second home was also bombed. This time Wenzu took his family to Balzan. Mizzi had nine children, four of whom played competitive football. The most noted, perhaps, was Eddie who played for Balzan Youths, St George's and Malta. Another of Mizzi's sons, Joe, also played for Balzan Youths and served on the club's committee as secretary. Emmanuel kept up the family tradition and turned out for Balzan Youths while Tarcisio figured for Balzan Youths and St George's. Wenzu Mizzi died on July 3, 1965 leaving behind him fond memories of the golden 30s. His epitaph was given perhaps by his friend and colleague, Turu Theobald. The famous Hibs' wizard once told me: 'There was never another one like Wenzu... he was great'. This was a fine tribute from one great professional to another.